This map was presented by the Australian Department of Defense in a section of their 2013 White Paper report titled “A Stable, Rules-Based Global Order”. In this section just above the map, the report states, “The Indian Ocean is now surpassing the Atlantic and Pacific oceans as the world’s busiest trade corridor. Rapid economic growth in South, Northeast and Southeast Asia is driving stronger economic links with the resource-rich Middle East and Africa. One-third of the world’s bulk cargo and around two-thirds of global oil shipments now pass through the Indian Ocean” (27). The report goes on to say, “It will be important for countries with an interest in Indian Ocean trade and energy flows to strengthen security collectively by supporting the development of Indian Ocean regional architecture such as the Indian Ocean Naval Symposium and the Indian Ocean Rim Association for Regional Cooperation” (28). We see that in this report, the Australian military is setting itself up for a pivot towards securitizing the Indian Ocean as it continues to develop into a center for the global economy. The map aims to illustrate the importance of a new trajectory of geopolitical strategy for Australia and others given the shift of maritime trade to the Indian Ocean. This shift can be seen as ‘cartopolitical’ according to Daniel Alphonsus. This is because the South Asian region of the Indian Ocean is now seen as a region with significant maritime influence at a planetary scale, and Sri Lanka sits as its fulcrum. We see this epistemic shift in cartopolitics in the map below. As such, the Australian military map provides justification for the project of enhanced cooperation to secure economic interests. The map itself shows not much more than a gradient for density of shipping routes. We can see that this gradient is not heavily graduated, with yellow and red being the colors that are mostly visible. Once we get to the Indian Ocean region we see a lot of red in narrow lines, which comes off as misleading given the wider lines coming from the West via the Pacific Ocean that also includes streaks of red. The map, visually speaking, could very well reproduce a Western-centered approach to visualizing the ocean given the significant color and spatial features we see coming from the west. These features are minimized in the Indian Ocean region due to the size of the lines and lack of a wider color gradient. The density of shipping seems similar to those of ships leaving the Pacific Northwest, rather than carrying “one-third of the world’s bulk cargo” and “two-thirds of global oil shipments”. However, the fault is not entirely with the mapmakers themselves, as the terrain of shipping in the Indian Ocean would very well make it difficult to visualize the region’s significance. Ships must pass through very narrow areas such as the Mandeb and Malacca Straits. One of the most obvious questions that can arise from the map is the label “Shipping Density” without any specification as to what kind of shipping. Given the argument that is being presented by the Australian military, we can assume it means cargo shipping. By only depicting one type of maritime activity, maritime infrastructure in the region is not put in conversation or interaction with other realities of the region, such as refugee boats, oil spills, piracy, maritime conflict, etc. The ship movements are rationalized as an inevitability that must be protected. As such, the map effectively supports the claim that these shipping routes need to be made more ‘secure’. However, one must ask why such an argument needs to be supported in a way that obfuscates other maritime realities. We find similar practices of documenting maritime movement. In Sunil Amrith’s powerful account of the Bay of Bengal during the colonial era, he features a map of primary ship movements in the region. Here, we see a very similar, albeit simplified version, of the map featured by the Australian military. 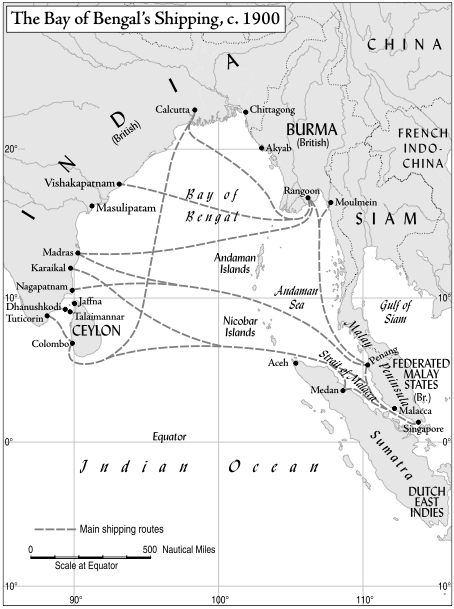 What is obfuscated in this map is the fact that the primary shipping routes were in fact used for trafficking laborers from Southern India to nearby colonies. To refer back to the original question of why an argument must obfuscates various other equally present realities, we can turn to William Bunge’s practice of moving “inward toward those pockets of place not un-discovered but overlooked or exploited” (Morris & Voyce). 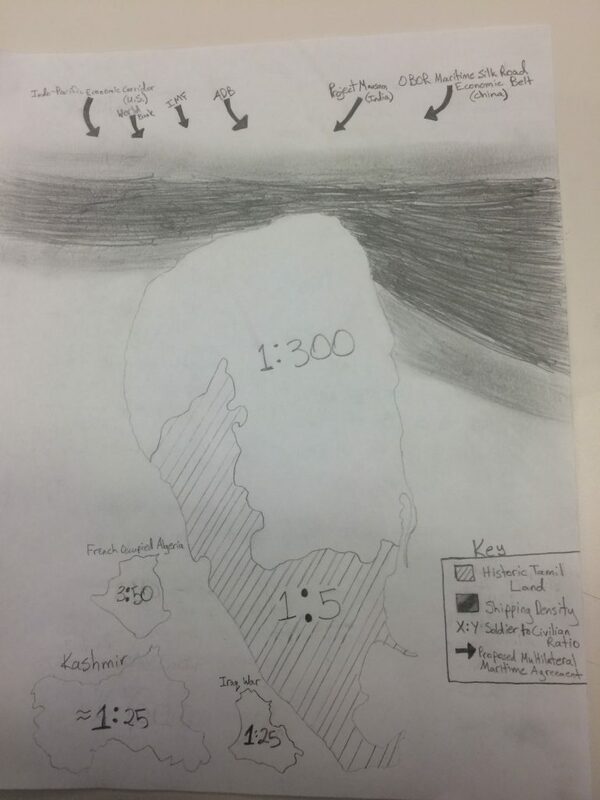 For my map prototype, I aimed to not silence the visual depiction of “Shipping Density” presented by the Australian military, but rather zoom in on a particular point of attraction and place it in conversation with other realities that can be visualized. My map turns Sri Lanka ‘upside down’ to look at an often-invisiblized part of the country more closely. I’ve illustrated the shipping density that passes through the southern portion of the island, consistent with the Australian military, and have indicated proposed multilateral mechanisms for enhancing maritime trade security, of which the Sri Lankan government’s support and cooperation are of primary interest for global powers. I’ve documented the soldier-to-civilian ratio of the region based on ethnic majority. These levels reflect levels that existed during the war, although global powers identify Sri Lanka as undergoing a post-war development process. As such, visualizing troop concentrations, and comparing them to other active war zones, we see a troubling reality that is not grappled with when Sri Lanka’s proposed maritime and economic development is discussed and celebrated at the geopolitical level.